Jane is a heartwarming documentary about the early years of Jane Goodall’s career, when she first set foot in Africa and tried to gain the acceptance of chimpanzees of Gombe National Park, Tanzania. If you’re unaware of who Jane Goodall is then let me give you a quick introduction. Most people assume that she is the primatologist known for undertaking long-term research of mountain gorillas in the forests of Rwanda, however that was in fact Dian Fossey. Both Fossey and Goodall were encouraged to undertake daily studies of great apes in the late 1960’s by the paleoanthropologist Louis Leakey, who was trying to unlock the secrets of early humankind behaviour. However, Goodall studied the chimpanzees in Tanzania from the age of 26 with no scientific training, which meant that she had not been corrupted by the then held views of the time. This is exactly what Leakey was looking for and Goodall would go on to revolutionise our views of chimpanzees and what it meant to be human. Back to the main event, this truly magnificent documentary by director Brett Morgen uses mainly expedition footage shot by National Geographic filmmaker Hugo van Lawick who was sent out to Tanzania to document the studies being conducted on chimpanzees by Goodall. Both would eventually fall in love and marry, which is part of Goodall’s history that I was unaware of! Again for those of you who may not be aware, Hugo van Lawick was a master behind the camera and is regarded as one of the best wildlife filmmakers to have ever lived, so do go and seek out his films as you will be blown away! The documentary itself is told from Goodall’s perspective on how she managed to go from a naive mid-20s young woman to a renowned scientist and the hurdles she had to face along the way. One of these was being an untrained woman in a male-dominated field, with her observations turning the scientific consensus on it’s head. Goodall has always been a powerful role model for myself, not because of the reason mentioned (for obvious reasons) but because she had very humble beginnings and slowly worked her way to a level of prestige. Goodall’s passion and drive to never give up may have rubbed off on me slightly. Most importantly I feel that Jane reminds us of the mark left on the world by Goodall and the legacy which she has created. I recommend that you have some tissues handy as there are a few parts in the evocative tale that do pull on your heart strings. One of these is footage of a polio epidemic that unfortunately left some of the chimpanzees unable to walk or use their arms, so the team did what they had to do and shot the animals to stop them suffering. This is particularly hard for Goodall who had worked tirelessly hard to gain the trust of the animals, giving them names and forming friendships which was very different from the norm. But how could you not when the animals you’re studying are so very human? 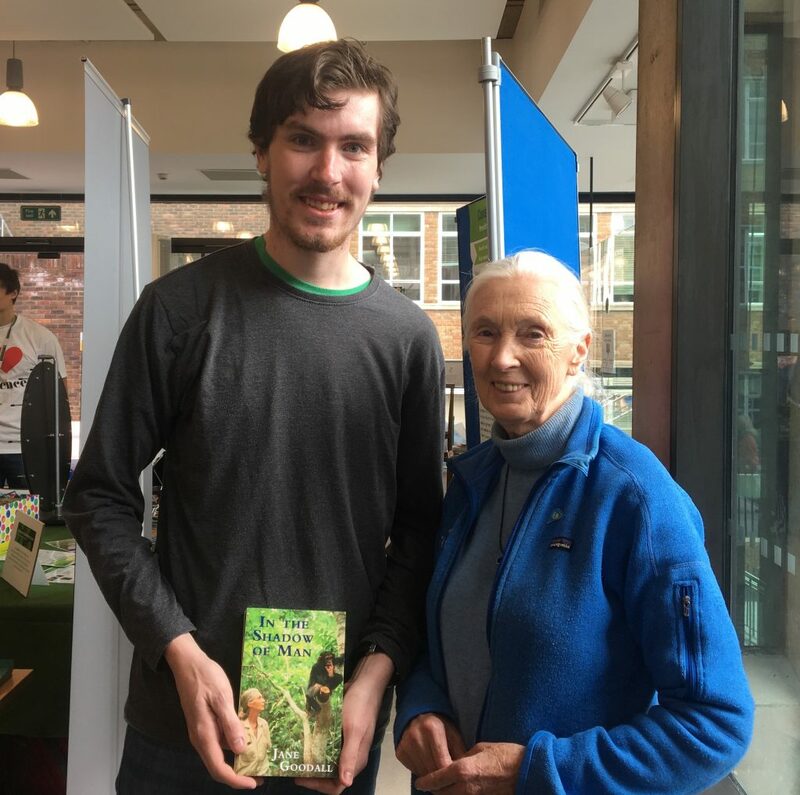 Luckily I managed to meet Jane in 2017 in Cambridge as part of the Earth Optimism event, she gave the opening talk and hang around for the rest of the day to speak to people. On that day she also signed my copy if ‘In the Shadow of Man’ and we had a wonderful conversation on how the actions of individuals can motivate the crowd to help make a difference in conservation. I know people say that you should never meet your heroes but they never say don’t meet your heroines. I’ll never forget our short interaction, it was a window into the life of someone who has spent their entire life trying to protect the planet and the wildlife it contains. In case you’re wondering, you can catch Jane on Netflix, it’s 90 minutes long and I can guarantee that you will love it!